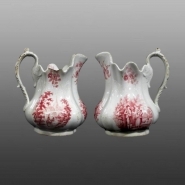 This smaller size jug shows the clasped hands print very well. Another large size jug decorated with genre scenes. 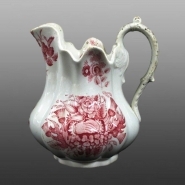 Earthenware jug with underglaze pink printed decoration. On each side is a print of lovebirds and beneath the lip is an image of clasped hands. Both of these images are symbolic of the labor movement and, in this case, symbolize brotherly love and mutual support which the Society of Operative Potters hoped would bring success to their manufacturing venture. Other pieces from this factory have conventional designs with floral sprays and genre scenes, they are shown as additional images here.